What a difference a year makes. This was the very first episode of “The Adventures of TasteeBQ”, released on BuzzFeed in January 2013. We are happy to bring it to WordPress, in an updated edited version. For the past year, the original article/short story has been shared almost everywhere. It is being used as a language learning tool across the world, like in the Bengali-to-English Dictionary. Hope you enjoy. For Original Short Story on Buzzfeed Burgers And Beyond! TasteeBQ Goes To The Super Bowl!! Grilled Burgers may be the goal, but there is more you can do with the Grill on Super Bowl Sunday. Our hero TasteeBQ was called to the Rescue by Jill, a Damsel in Distress. Tired of frozen burgers and salty hotdogs for Super Bowl, Jill was determined to do something more exciting on the Grill. Plus, some of Jill’s expected guests were from the Tribe of Vegan. On a lifelong Mission to defeat his longtime archenemy Boren’GFood, our Hero is always happy to lend a hand. TasteeBQ flew to Jill’s lair immediately and was amazed to see her Pantry, which contained everything needed. With an assist on the Grill from her husband Jack, Jill was able to make 5 Super Easy Super Bowl Recipes for the Grill. 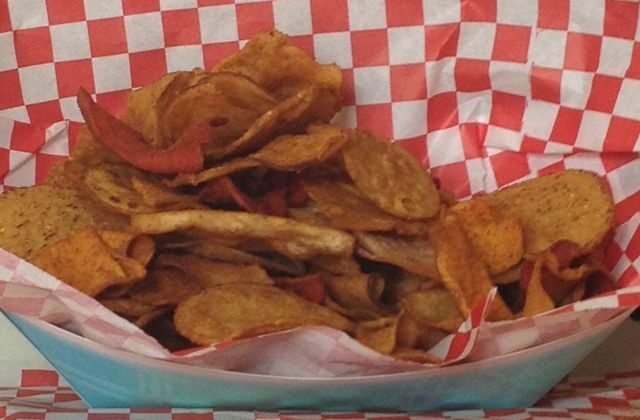 Smoked Barbeque Chips- a quick and delicious recipe. Use whatever kind of Chips you like. General Supplies: BBQ Grill (Gas or Charcoal), Wood Chips (Hickory, Mesquite, Cherry, and/or Apple), Grill Tongs and Spatula, Metal or Foil Pans and Aluminum Foil. It’s not really a recipe, more of a Neat Trick or Technique. Use any flavor Chips you like, sprinkle with BBQ Rub (optional) and put them on the Smoker for 8-10 minutes. Use Indirect Heat Method to add a fresh, delicious Grill Smoked Flavor. This works especially well with Chips for dipping and served warm. 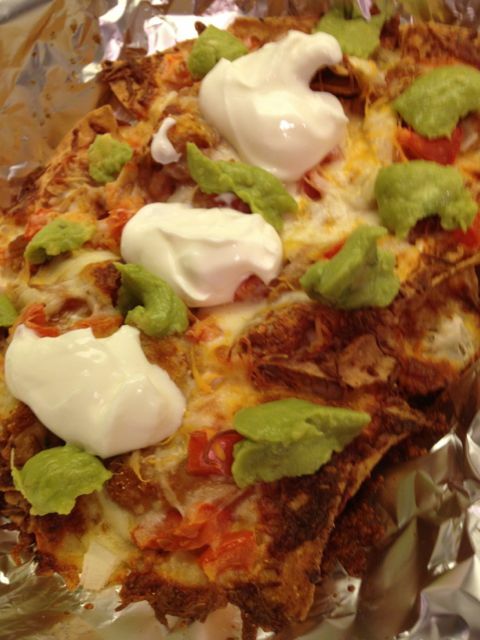 Take your Nachos on a Detour to the Grill for some amazing flavor. Supplies: Tortilla Chips, Cheese, Salsa and a variety of Toppings which can include: Chopped Onions, Tomatoes, Jalapenos, Black Beans, Sour Cream, Guacamole and Bean Dip. For meat, add Taco Seasoned Ground Beef, Cooked Chicken, Steak Bits or Crispy Bacon. Layer the Tortilla Chips evenly across the bottom of Foil Pan. Sprinkle Chips with one layer of Shredded Cheese (helps prevent the Chips from getting soggy). Next, spread Black Beans (or Bean Dip), Chopped Tomatoes, Onions and a final Topping of Shredded Cheese. To the Grill! The Chips are smoked on Low Indirect Heat for 12-15 minutes. Guests can top their own Chips with Sour Cream and Guacamole. A choice of Mild Salsa, Jalapenos and Cholula (or Tapatio?) Hot Sauce would also be nice. Take some of the Romaine Lettuce to the Grill before mixing any Green Salad. It will add a Smoky new layer of flavor. 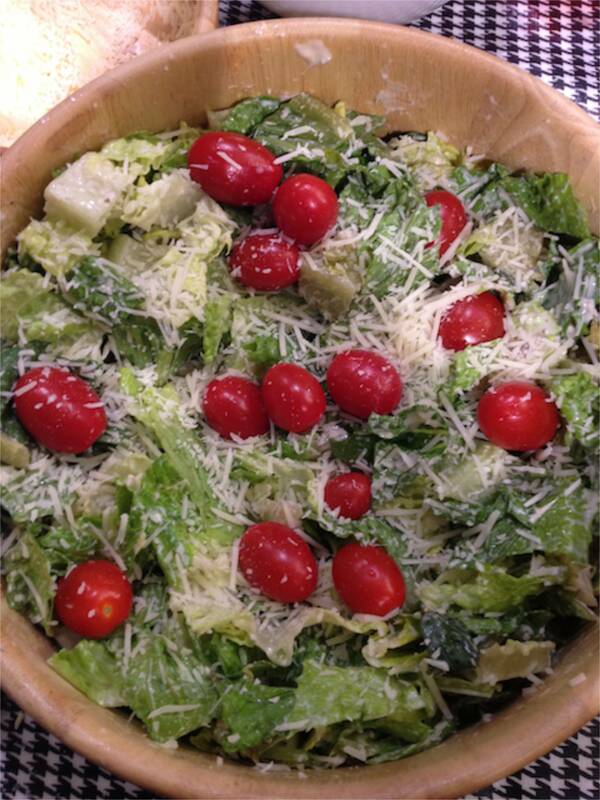 Supplies: Romaine Lettuce, Olive Oil, Caesar Dressing, Croutons and Parmesan. Rinse and dry heads of Romaine Lettuce, then chop in half. Drizzle 1/3 portion (of all Lettuce) with Olive Oil and grill on Medium Heat for about 5-7 minutes (until lightly caramelized). Then chop both Fresh and Grilled Lettuce into 2-3 inch squares. Toss in Caesar Dressing, (optional) Croutons and Parmesan. Add Chopped Fresh Basil and Cherry Tomatoes for even more flavor. Super Bowl Twist- Substitute large cracked Fritos or Doritos for Croutons. The short cut Recipe is to use pre-cooked wings for the Grocery Deli Dept. If you want to Grill Fresh – Go For It. Re-season the Precooked Wings with Dry BBQ Rub/Seasoning. Then grill Wings on Low Indirect Heat for approx. 15-20 minutes. Use Wood Chips for smoked flavor. 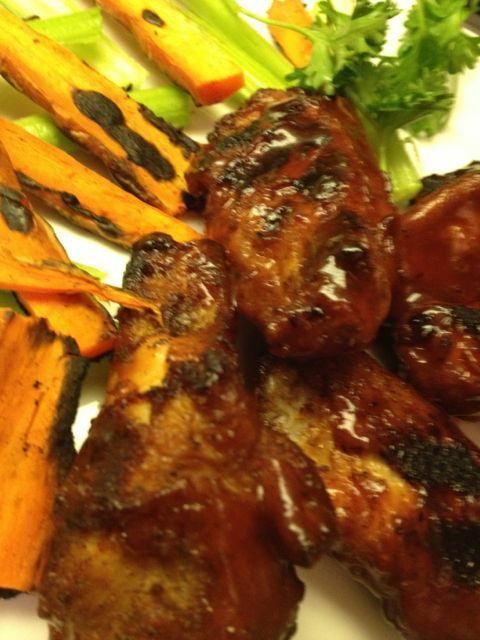 For Buffalo Wings- Toss wings in Franks Hot Wing Sauce, garnish with Celery and Grilled Carrot Sticks. For Barbecue Wings- Toss wings in your favorite BBQ Sauce, garnish with Grilled Texas Toast. For Teriyaki Wings- Toss wings in your favorite Teriyaki Sauce (Asian Sesame Dressing is also OK), sprinkle with Chopped Green Onions. Serve Wings with Bleu Cheese and/or Ranch Dressing on the side for dipping. For Fresh Chicken Wings, season overnight with BBQ Rub. Grill for 40 Minutes to 1 Hour before Tossing in Finishing Sauce. Supplies: Ground Beef, BBQ Dry Rub, Salt, Pepper and Worcestershire Sauce. Mini Hamburger Buns; optional Condiments- Cheese, Tomatoes, Lettuce, Onions, Pickles, and Jalapenos. Sauces- 1000 Island Dressing, Herb Mayo (Mayo mixed with Dry Garlic/Italian Seasoning), BBQ Sauce, Stoneground Mustard and Ketchup (for the kids). Use 1/5 to 1/4 lbs. Ground Beef per Burger. Season with Salt, Pepper, BBQ Rub and Worcestershire Sauce. Make small Patties and Grill on Medium High Heat for 8-12 minutes, depending on thickness/desired doneness. 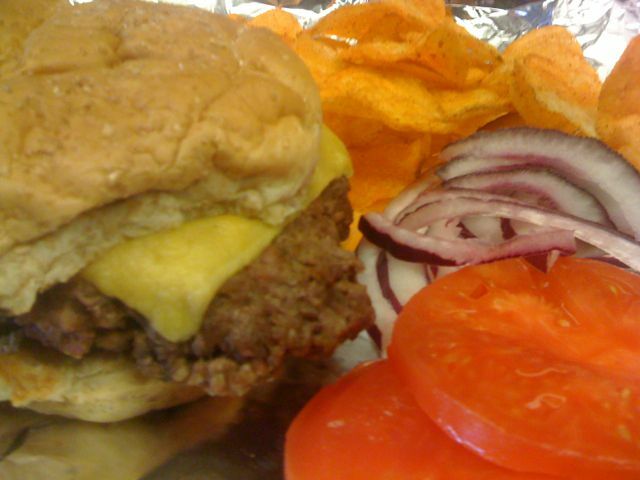 Flip Burgers at 4-7 minutes, then add Cheese halfway thru second side. For Long form Original Short Story on Buzzfeed Burgers And Beyond! TasteeBQ Goes To The Super Bowl! !